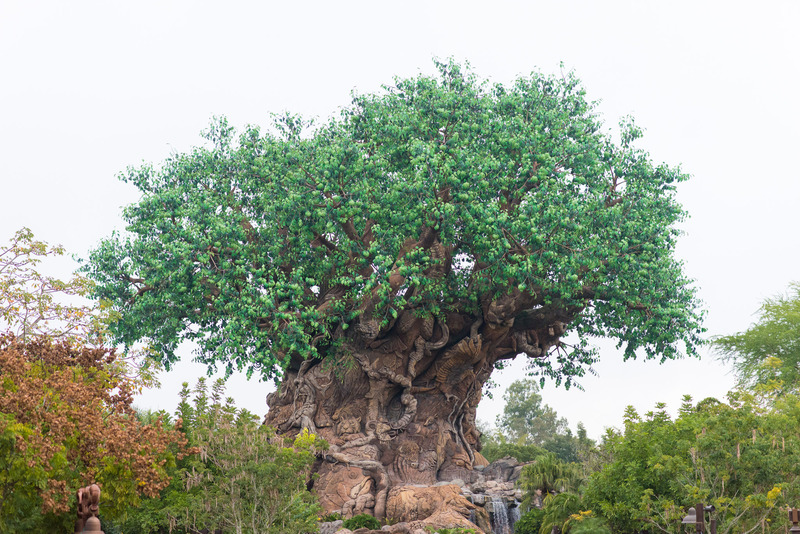 In my previous post I reviewed the RideMax plan I had made for my daughter and I to get through several attractions at the Animal Kingdom this past Thursday, December 9th. This is a report on our vist. If you want to know more about the plan details, be sure to see the previous post here on the RideMax blog, where I outlined some of the decisions that went into this one. For those who don’t want to take the time to do that, I’ve copied the plan above. As you can see, we were set to start the day with two rides on Expedition Everest. 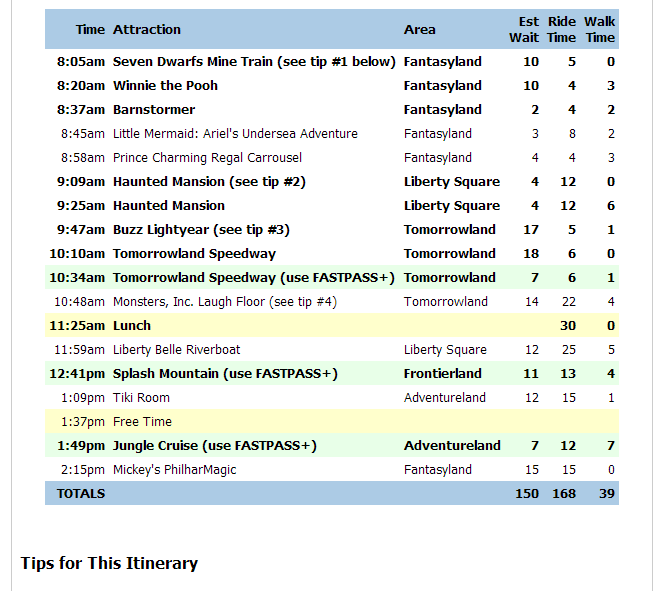 The plan was to ride in the standby line first, then use our FastPass+ reservation for the second ride. We arrived inside the park fifteen minutes before opening time. 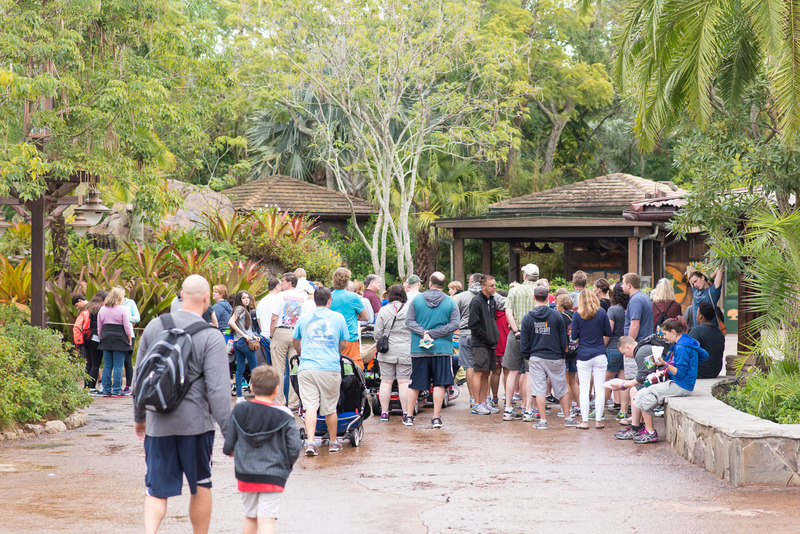 The picture above shows the “crowd” lined up heading in the direction of Expedition Everest. Not too bad, really. OK, it’s been a while since I’ve done any RideMax Roulette, so I plan to visit Disney’s Animal Kingdom with my daughter tomorrow, December 8th, for the next round. 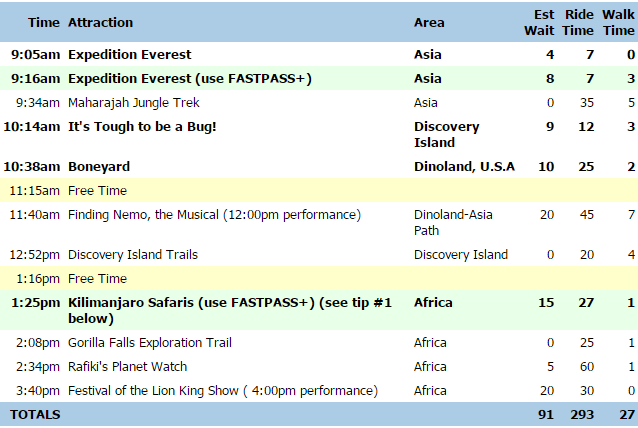 After looking at this list, I decided to use FastPass+ for Expedition Everest and for Kilimanjaro Safaris, and gave that information to RideMax when I was creating my plan. Note that the plan has us visiting Expedition Everest twice right off the bat, and I probably don’t need FP+ for that second visit. I think RideMax is just trying to cut down on some walking here by getting them both out of the way early, as we don’t have any need to return to this area of the park later in the day. After I had created the plan, I also was able to get a FP+ reservation for that 4:00pm FOTLK show, though I doubt we’ll really need it there either. The Safaris is likely the only place we’ll find FP+ all that helpful with this particular plan. I expect to post “live” to Twitter and Facebook during the day, so if you want to follow along, you can do so here and here. I also plan to report back with a blog post next week on how the day went, so stay tuned for the follow-up! 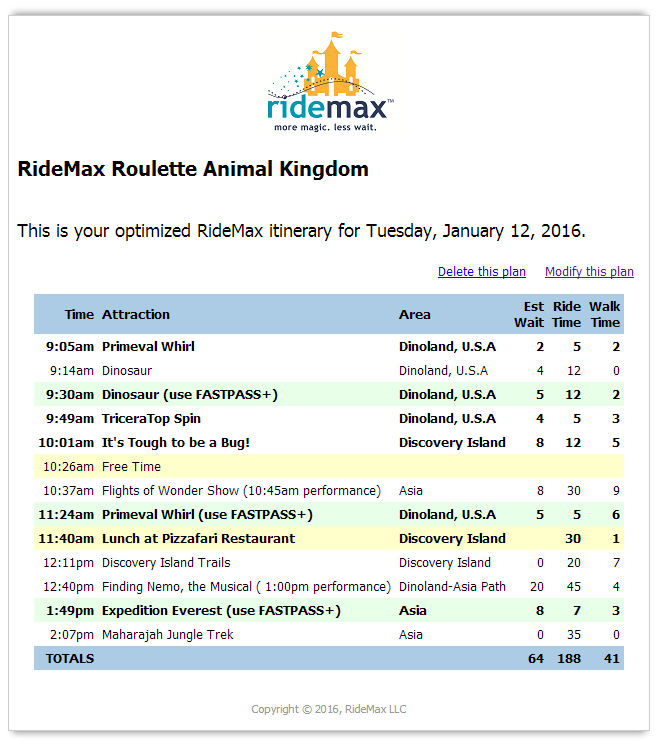 For those who follow this blog, you know that I like to play a little game I call “RideMax Roulette.” I select a list of attractions at random, plug them into RideMax, then take the resulting RideMax touring plan to the park. 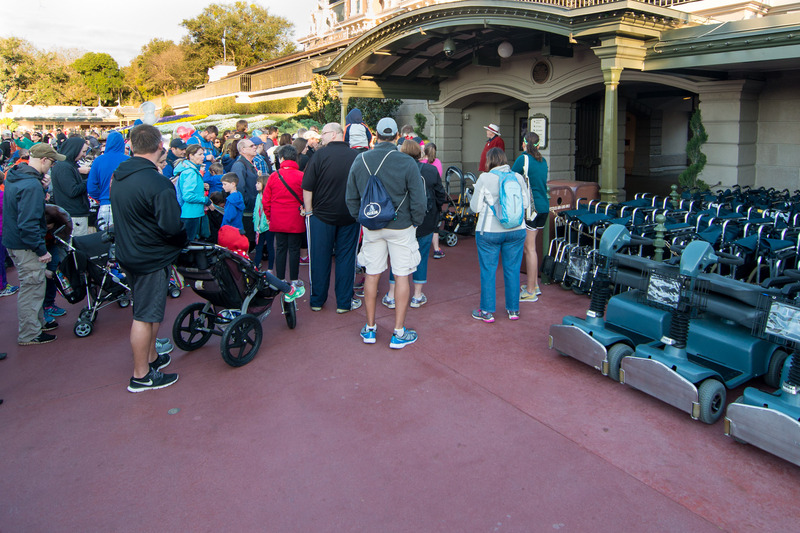 I decided to do this again last Thursday, February 25th, when the Magic Kingdom opened at 8am. 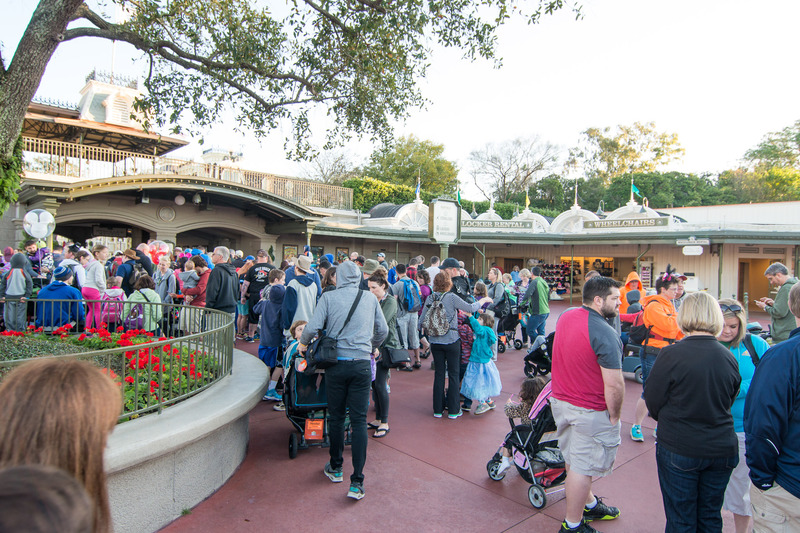 These hour-earlier-than-normal openings are great, as they can really give you a jump on the crowds. 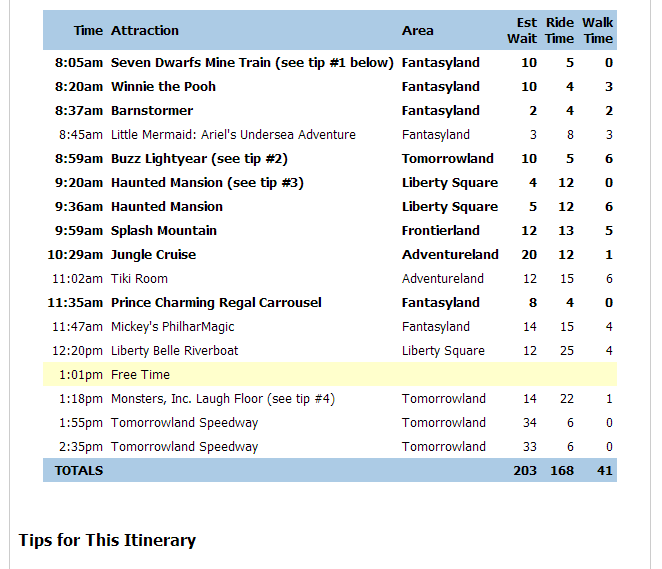 (This advantage for 8am openings applies at both Disneyland and Walt Disney World, by the way.) Add to that the fact that Thursday was a “RideMax Recommended” day for the Magic Kingdom (even without the 8am opening) and it sounded like a great day to get out and take a RideMax plan for a spin. I’m not finished yet, though, because I’ll definitely want to use FP+ to see if I can reduce the amount of time I spend in line. 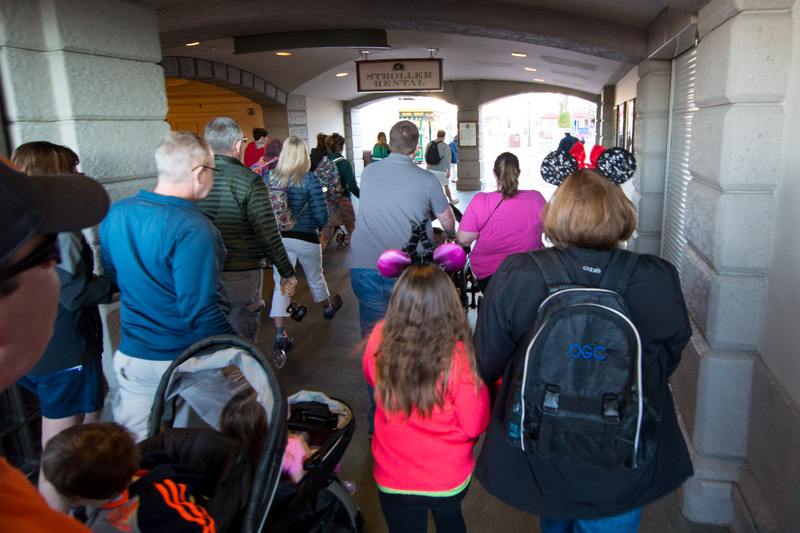 Because it’s hard to know in advance which FP+ will be available for any given date and group size, you get to decide for yourself which specific attractions you want to use FP+ for when creating your RideMax plan (and the “Tips” inside RideMax itself can help you prioritize if you’re unsure). If the plan begins right when the park opens, which attraction is showing up first thing on the RideMax plan? 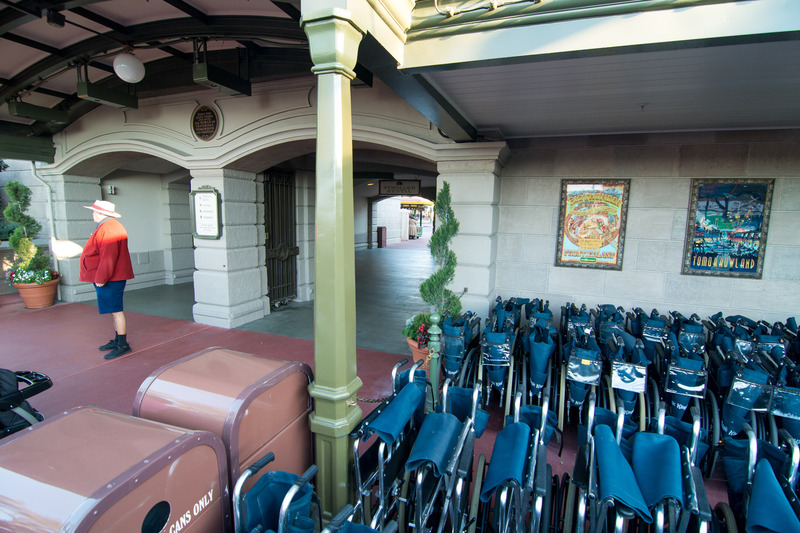 Because the minutes right when the park opens are so valuable in terms of short wait times, if FP+ is available for that first attraction, it’s likely a good candidate to consider using FP+ for. 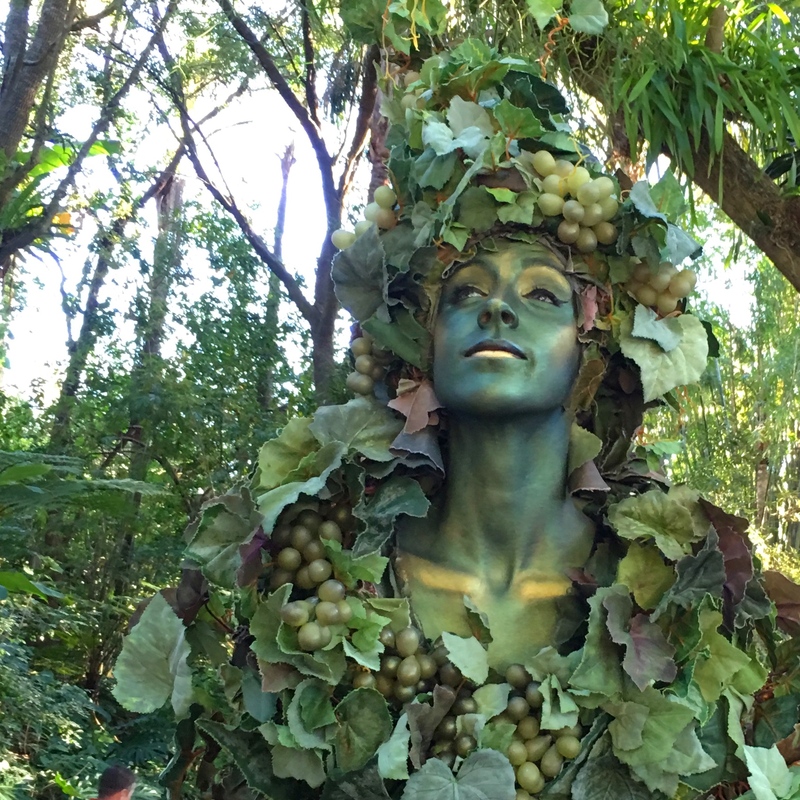 Which attractions in the list have the longest wait times? These are also good candidates for FP+, if available. 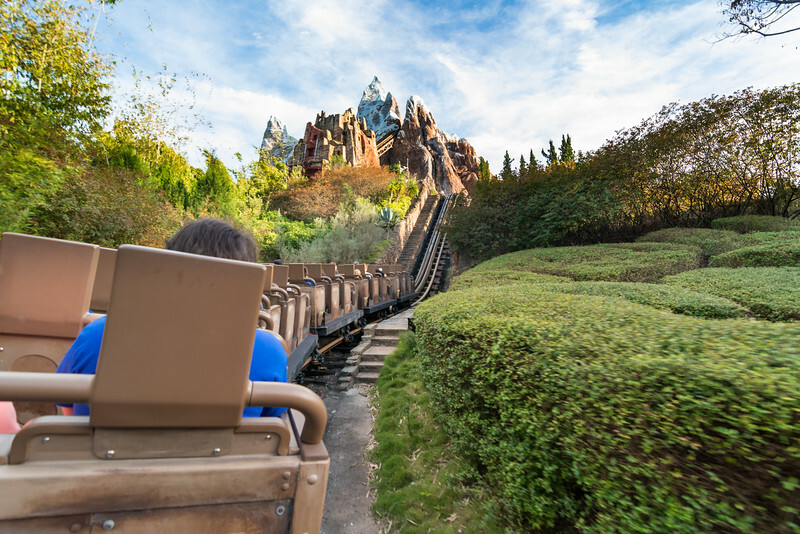 Using that first criterion above, Seven Dwarfs Mine Train would be a good candidate for FP+ because it’s the first thing on the list and is taking up that very valuable first time slot. Unfortunately, I’m creating this plan just two days in advance of my visit, and FP+ reservations for 7DMT are long gone by now. I’ll just have to bite the bullet and ride this one standby. So, using the second criterion, I’d look at what are the attractions with the longest wait times, and are there FP+ reservations available for these? In the plan above, the two attractions that stand out the most are the Tomorrowland Speedway and the Jungle Cruise. I typically don’t like to use FP+ for a “show” attraction like PhilharMagic (with 14 minutes just being a conservative worst-case scenario estimate, and where FP+ likely wouldn’t make a bit of difference), so the next one I’d consider using FP+ for is Splash Mountain. Note that in this plan with FP+, RideMax has knocked 53 minutes off the original overall wait estimate, and a couple of minutes off the estimated walking time as well, so this looks pretty decent. 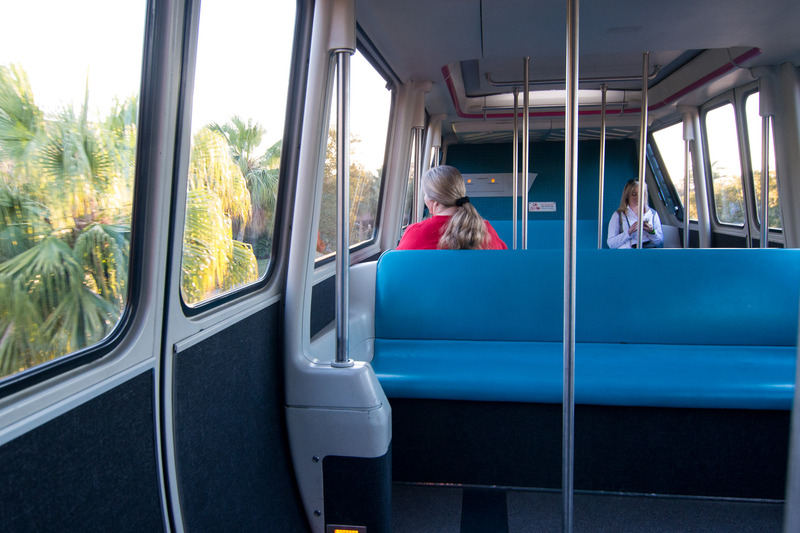 I arrived in the parking lot a little later than I had hoped, but I was still on the resort monorail by 7:24am. (The express monorail wasn’t running yet.) As you can see, we were packed in pretty tight here without a lot of elbow room. Even though the above scene may look fairly busy, this is really nothing compared to the crowds you’d see 25 minutes before a 9:00am opening. So again, these 8:00am openings are golden. In the picture just above, I’ve made my way to the opposite side of the crowds shown in the previous picture, and I’m now standing over near the wheelchair rental area. Especially if I’m heading to Mine Train first thing, I like to get as close to the tunnel as possible, even if it’s off to the right-hand side a bit. Here, I’ve moved into position in an empty spot of concrete nearer the entrance tunnel. The countdown finishes at 7:45am, and we’re off! For those who were wondering, Tuesday went really well in terms of low wait times and a decent touring plan. About the only downside was that I lost my prescription eyeglasses on Expedition Everest while trying to ride and simultaneously video stream the experience on Periscope. (I have to admit I thought it was fun to “scope” the ride, though, and I’ll have a longer follow-up post on Periscope later today or tomorrow.) All’s well that ends well, as Disney has found my specs and promised to put them in the mail today. After seeing this plan, some of you may have been wondering about that second green line, the FP+ at Primeval Whirl. This was my second ride on that particular attraction, where I also began my day. I’m guessing some of you were wondering if it wouldn’t have been faster and involve less walking to just do that second ride on Primeval Whirl right after the first one, rather than coming back to it later in the day? And if you were thinking this, you’d be right. This is a case where using FP+ actually *hurts* the overall efficiency of the plan. In fact, RideMax estimates that I’d save about eight minutes of walking (with a similar amount of waiting) if I just hit Primeval Whirl again the second time right at the top of the day, rather than using FP+ and coming back later. One big reason that using FP+ for the second ride on Primeval Whirl is less efficient is that when you make your FP+ reservations, you’re forced to “space out” the reservations so that they don’t overlap, and RideMax knows about this restriction when it creates your plan. So, because I already had a FP+ for Dinosaur that ran from 9:05 to 10:05, the earliest time slot available for that second ride on Primeval Whirl was sometime *after* that. There are a couple of lessons I draw from this. First, it pays to play with your options in RideMax before settling on a final plan for the day (and this especially applies to your FP+ options). Second, maybe you really *do* want to use the plan the way it’s outlined and use FP+ for that second ride on Primeval Whirl. Why would you do that? If you really do plan to leave the park as soon as the plan is finished, then you probably shouldn’t. If, however, you’re trying to get a fourth FastPass for the day and want to visit attractions after the formal plan is finished, it might make sense to follow the plan and “burn” that FP+ anyway. Remember, you can’t get those fourth (or fifth…) FP+ reservations until you’ve actually used your first three. I hope this helps reinforce the idea that experimenting with options in RideMax is a good thing. And thanks again for following along on this latest round of RideMax Roulette!